In one of emails from David, he asked coworkers to make recommendations for our children, saying: "Dear coworkers, There is a suggestion to encourage our children to read good books for their spiritual, intellectual and emotional growth instead of spending too much time for watching videos or chatting. If there are any books that you want to recommend for our children please send the list of the books. You can recommend the books according to age level such as elementary school, middle school, high school, and college based following categories; 1) history books, 2) biographies 3) educational books (literature, social, science, etc.) 4) spiritual books 5) others. After collecting recommendations, we will share the list of recommended books. Thank you." In "others" category, I recommend encouraging kids to do singalongs Christian hymn songs such as "Jesus loves me this I know" or "Faith is victory". My littlest grand daughter Aleeza is one year young, and she already memorized the song, "Jesus loves me this I know." Last Christmas time we had a family gathering where my 6 grand-kids came out and served a music program: the three bigger kids sang Christmas carol songs, the younger three did the dance. In today's daily bread passage (Mark 5:21-34) we see honoring the faith of the woman saying, "Daughter, your faith has healed you. God in peace." Lord's blessings upon the parents and children working through faith in the Lord. 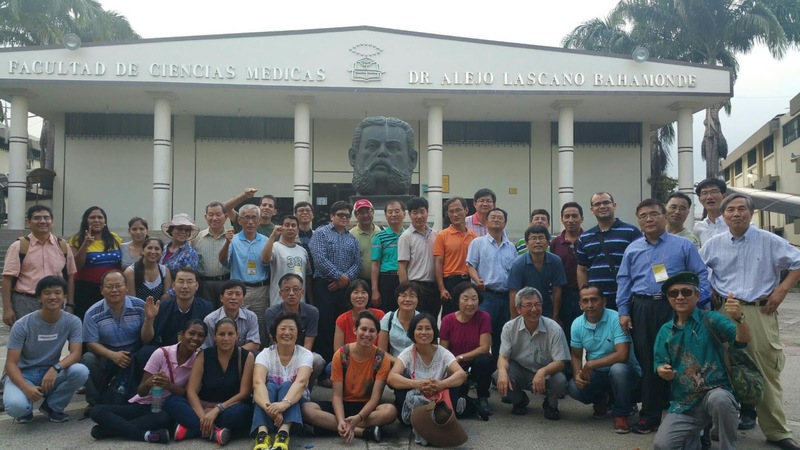 Latin Coordinator's annual conference was held in Guayaquil, Ecuador during 1/27-30. The title of the conference was "Pongamos nuestros ojos en Jesus" "Let us fix our eyes on Jesus!" (Heb 12.1-29). 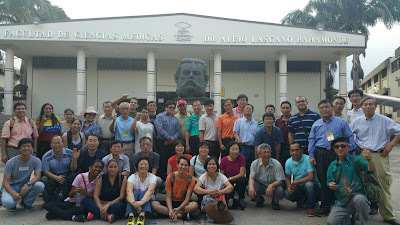 40 attended from 17 Latin countries (absent from Paraguay and Colombia) including 8 from USA and 1 from Korea. 11 Latin leaders attended with stewardship. 3 of them pioneered Peru, El Salvador and Dominican Republic. 2 of them succeeded Korean missionaries in Guatemala and Caracas, Venezuela. Moses Chang (Belize) delivered the opening message with the title, “Count the stars!” (Gen 15:1-21) God keeps his promises to give many descendants though it may take long time. But what God really wants is beyond Isaac, Jesus, through whom all people will be blessed. We should focus on God more than our descendants in our pilgrim life. 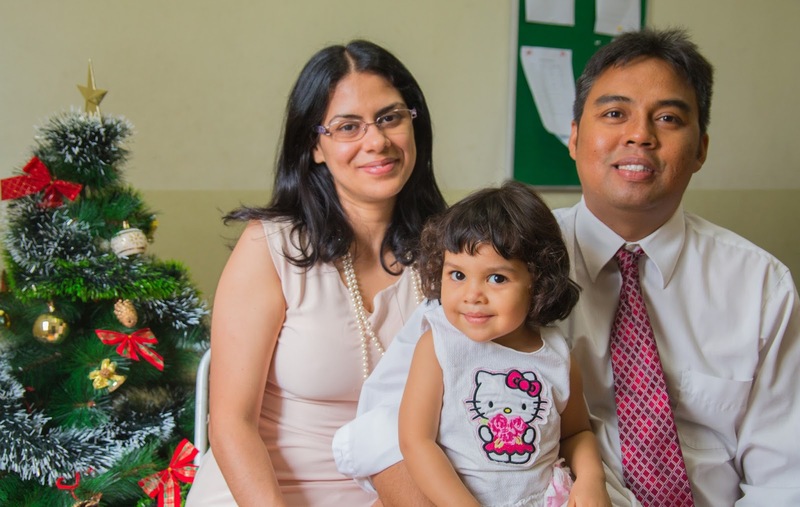 On the morning of 1/28 Gustavo (Caracas, Venezuela) delivered his message, "God restored Elijah" (1 king 19.) He testified how God also restored him last year with the word of God when he felt burn out as a successor of Caracas with sicknesses, heavy burden of ministry, self supporting and national economic crisis. In the afternoon there were 6 Groups discussions' about health, 2nd gene education, finance and self supporting. Especially ministry succession among national leaders' group was very meaningful and useful. 2 Special lectures, "S. David Nam's "Restoration from burnout" and Dr.Paul Hong's "Life Management" were very helpful for all. On 1/28 Pastor Abraham Kim delivered (M. Juan Seo as a translator) "Let us fix on Jesus" very powerfully. M. Andre and Ana Kim (Ecuador) volunteered to host this conference as one house church mission. They sacrificially and excellently served all. May God bless their house church (Juwang and Esther) and Ecuador. M. Timoteo was honored with a plaque of thanks for his many years services as a Latin coordinator. Latin Directors earnestly prayed to pioneer 5 countries (Cuba, Trinidad n Tobago, Bahama, Jamaica, Haiti) and US Puerto Rico by 2,020 through co-working with NY chapter. Next year Lqtin coordiantor's conference will be held in Belize on 1/18-21/2017. In today's daily bread (Mk 1:45-50) on cleansing the leper Jesus asked him not to tell anyone of this but rather go and show to the priest and offer sacrifices Moses commanded. But instead the man went out and began to talk freely spreading the news. 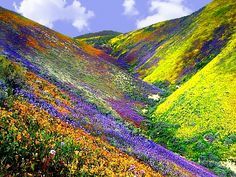 The man became self-seeking, perhaps showing off his body with brand new skinset, not knowing that the body is for the glory of the Lord. Missionary Philip visiting Sao Paulo sent news that Ataiena is in her 2 months of pregnancy. Middle in the picture above is Victoria (on coming March 11, 2016 she becomes 3 years young). Lord be with the baby in mother's womb to be strong and healthy. Thank God for giving a son to Msn. Finney & Deborah's family. Msn. 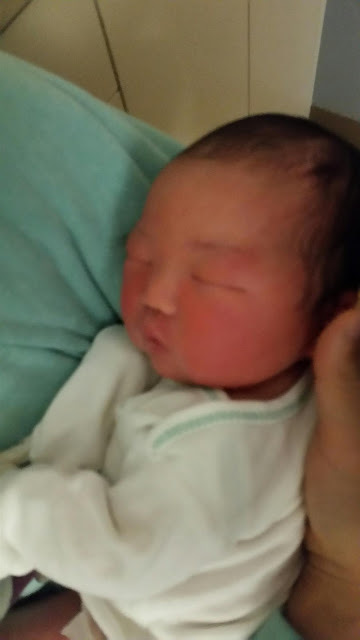 Deborah gave birth a son at 11 pm yesterday. She is in Downey regional hospital now. Please pray for her quick recovery and good health. May God bless the baby to be a source of blessing for many! First of all thank you so much for your prayer support and gifts for Africa. By God’s grace I was asked to attend 2016 African conference. God gave me desire to see a vision through this trip. Interestingly Cape Town in South Africa where the conference was hosted means “new hope.” 67 people attended: 33 African missionaries, 15 native sh., 10 second gen, 5 USA delegates, and 4 Korean delegates. 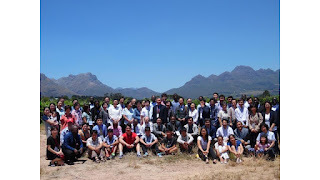 The conference venue was located in Stellenbosch, one of the Satellite cities of Cape-Town. Conference title was “Fix our eyes on Jesus” based on Heb. 12:1-2. At the opening message, Sh. Daniel Rhee(a silver msn in S. africa) served Luke 12:49 with the title, “I have come to bring fire.” When he tried to help African students with Jesus’ absolute words, he got backfire from his students who said, “He is so authoritative that he tried to push us to follow Korean ways.” So he was discouraged. But through preparing his message, he realized that Jesus came to bring fire on the earth instead of false peace. He newly decided to live as a warrior of the truth for Jesus’ name to change people and the world with the truth. He earnestly prayed that all UBF chapters be fully flared up by the holy fire of God’s words and the Holy Spirit for campus and world mission. After the message, there were mission reports from 15 chap. : Zimbabwe, Zambia, Makerere, Kyambogo, Rwanda, So Sudan, Capetown, Pretoria I, II, Ghana, Lagos, Medlag, Yabatech, Botswana, and Kenya. Especially native shepherds shared mission reports in Lagos (Abraham Omotune), Yabatech(Duke Ekokota), Kenya(Juma Fuchingo), Kyambogo (Kenneth Kyamanywa), Rwanda(Steven Sebbale). It was thanks to God’s powerful answer of our prayers that their leadership be transferred from pioneering missionaries to native shepherds. So far 11 countries were pioneered and they are praying earnestly for all 55 nations to be pioneered. 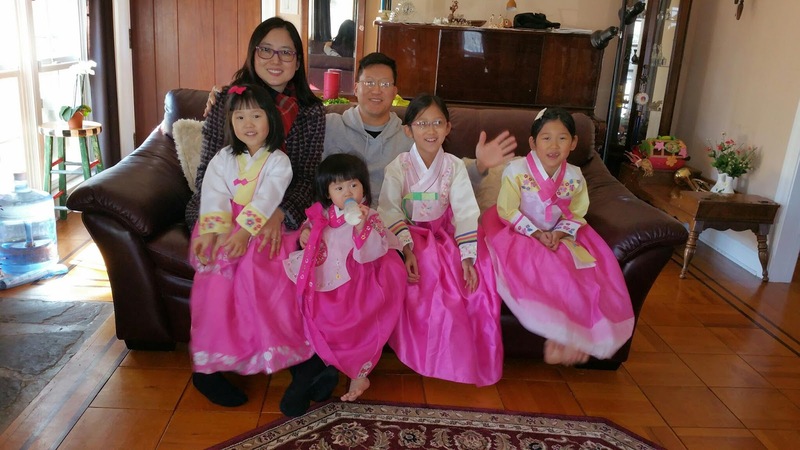 In 2016, they are praying to pioneer four nations: Ethiopia by Dr. Samuel and Mary Yoo, Mozambique by Thapelo and Sarah Motub,. Rwanda by David and Abigail Lu, and Lesotho. Msn Timothy Chung in Botswana attended and shared his report despite he got a leg injury and surgery for he broke the windows at night to fight against intruders to his house. Despite such tragedy, he amazingly confessed that he was rich in Jesus Christ and was filled with thanks and praise. There was lecture 1 on first night, delivered by Msn Mark Yoon in Keyna. It came from Isa 2, titled “The Law will go out from Zion.” He said that based on his experience campus students usually had 6 desires such as one wife, two children, three bedroom house, four-wheel drive car, five acres of land, six digit salary. That is why many streamed to campuses to become CPA, Doctor, or Lawyer. Nobody seems to be wanting or interest in becoming a Bible teacher. So how challenging is it for us to challenge them to be a Bible teacher? Young people like audio and visual music videos, stimulating sensual desires. The point of his message was, “How can we teach those people and attract people with the word of God as excellent Bible teachers?” He pointed out that we all must grow as excellent Bible teachers to teach people until we touch their spiritual nerves. People suffer from sins the most. Like Hebrews 4:13 and as Jesus touched Matthew’s selfish life with one word, “Follow Me,” we also touch their nerves in the same way. In Mark 11:22, Jesus says after He cursed the fig tree, “Have faith in God.” Msn. Mark confessed that Jesus touched his nerve one night and helped him to not trust the human things and determined to become an excellent Bible teacher to trust in the power of God’s words only. After realizing that this was what God really wanted him, he prayed earnestly that he may teach young students until each person is touched their nerves with God’s living words. After the message the presider, sh. Juma confessed that his nerve was touched through Msn Mark’s message and Bible teaching about Jesus’ paths in the Bible. I personally accepted one word through his message that I must grow as an excellent Bible teacher for my spiritual and physical children. As the last program of the first night, Dr. Paul Koh from Chicago shared his life testimony. Thanks to numerous spiritual training from Late Dr. Samuel Lee, he was able to deny himself and became a humble servant of God for God’s glory. On the second day, our gen. director, Dr. Ab. Kim served the message. In his message, all leaders are to fix their eyes on Jesus to grow in His holiness, teaching campus students, raising many disciples worldwide. He pointed out about 3 things that are eternal. 1. Christ like Character and eternal reward, 2. What we have given to God, 3. People who have been saved through our ministries. He encouraged all audience to take their eyes from what is temporal and pursue what can not be shaken and refocus our eyes on Jesus, our eternal King and run the race along the way Jesus went ahead of us with perseverance, until we enter His glory.” Second day afternoon all attendees devoted their time to write share deep testimonies in group. At the night program, we had a special lecture from sh. Changwon Kim from Korea about “Trinitarian Pneumatology for formation of Holy Community.” It was a carefully chosen session for there is a misunderstanding about the Holy Spirit in many churches and young believers in Africa. His presentation was very well structured and expounded how the Holy Spirit is building the healthy church community. He pointed out that the main role of the Holy Spirit is to increase our personal faith in Jesus and help us to be enlightened to serve the word of God effectively for Jesus’ world mission command. Also the Holy Spirit helps church members to love and respect each other to build up Christ centered community. On the third day, Sh. Andries Coetsee who hosted the meeting delivered the graceful and powerful message based on Hebrew 4:16 by encouraging all of us to approach God’s throne of grace with confidence so that we may receive His mercy in our time of need, especially in our mission field. After the conference, we have a photo session. Sh. Christian Coetsee who is the younger brother of sh. Andries C. gave me a tour to Stellenbosch University and prayed together and dropped by a famous tourist place called “table mountain” shortly on the way to Cape Town airport. It was very beautiful. Through this trip to attend the conference, I had to take several flights almost 50 hours. Although it was tired, it was an eyeopening experience. Especially I was impressed by African coworkers’ spirit and faithfulness in serving God’s work despite their hardship and economically unstable condition. My roomate, Msn. Nehemiah Kim from Zambia shared about his tough mission life to serve the campus mission by self supporting business. Because of economy down turn, he had to suffer greatly. But his children met Jesus personally although they are very young. So I realized that God richly comforted them through their children. Overall this trip turned out to be a great blessing for me in learning their spirit and knowing the God of Africa. My God gave me desire to overcome easy going mentality and repent a complacent satisfactory life and a stereotyped life and newly increase my personal faith to fix my eyes on Jesus, my eternal King and serve His eternal plan, campus and world mission command wholeheartedly to the end. Amen. One word: Fix our eyes on Jesus. 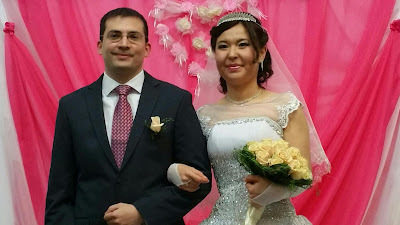 Pastor Abraham Kim officiated the wedding between Stamatis (Greece) and Akmaral (Astana, Khazachstan) with Matthew 6:33 after the CIS directors' conference in Kiev UBF center at 5 p.m with more than 130 attendees. It was so joyful reminding us the wedding of Cana in Galilee. 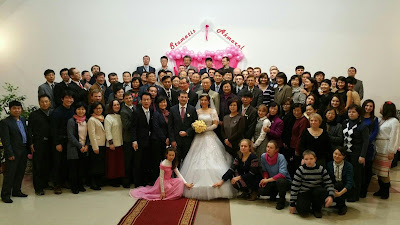 All were full of joy by this inter-continental house church to be the blessing for Greece and Khazacstan, Europe and CIS and the whole world by seeking God first. The reception right after the wedding ceremony in the same place was full of delicious food, special songs including P. Abraham's Edel Vais with guitar play, Dr. Paul and Sarah Hong's Sun rise sun set duet, group dance, Dr. Peter Kim's son with M. David Kim's dancing etc.